It would be wrong of me to keep this from you any longer. I have been in Maastricht for over two months now and I only have five words: I don’t want to leave. I bet you’ve never heard that before…But truly, this city has a special charm and I am beyond thankful for this experience. My first impressions of the city were that it’s insanely cute, reasonably sized, with plenty to do. I have enjoyed countless afternoons exploring the cobblestone streets, each with something different to offer. Maastricht is an international crossroads of history, economics, the arts, and so much more. In fact, if it wasn’t for the signing of the Maastricht treaty in 1992, the European Union we know today may not exist. This eclectic city has so much more to offer than meets the eye – beautiful churches and vibrant grass fields. 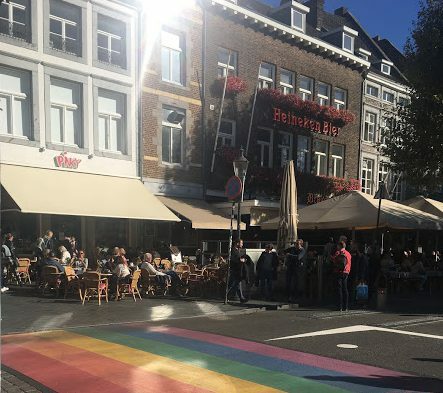 The city of Maastricht has always had a multicultural influence and continues to boast a truly international demographic. One of my favourite things about the city is that it’s super bike friendly! I ride to class, to the bars with my friends, and even carry my groceries on my bike. I feel so much safer on the roads here since the culture around cycling is completely different to in the US. Cars give way to you and respect your space on the road! My second favourite thing about the city is that people really value their lifestyle. No matter the day, the terraces are filled with people sharing meals with friends and loved ones. One Sunday morning I was headed to the library and saw a group of older gentlemen playing bocce – laughing and enjoying their time together. I am not sure why, but it caught my attention to see their carefree selves happily enjoying the beautiful day together. They didn’t seem to be worried about the upcoming week but truly enjoying the moment. There is always something going on in Maastricht. 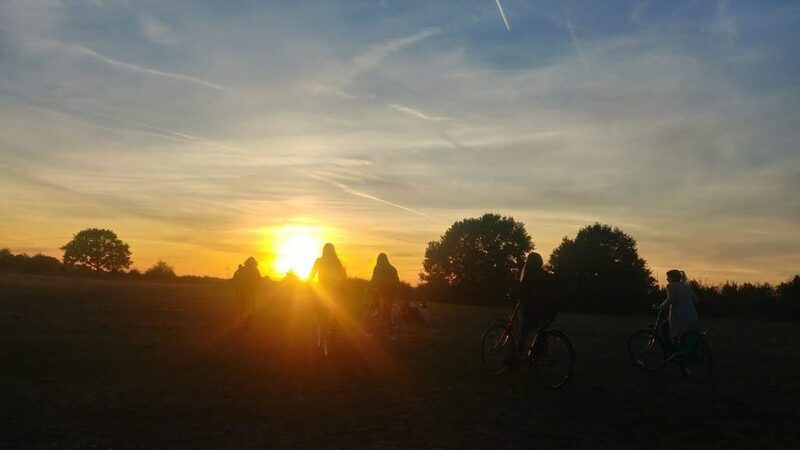 From jazz festivals, to Asian street food festivals, Maastricht is a happening city. 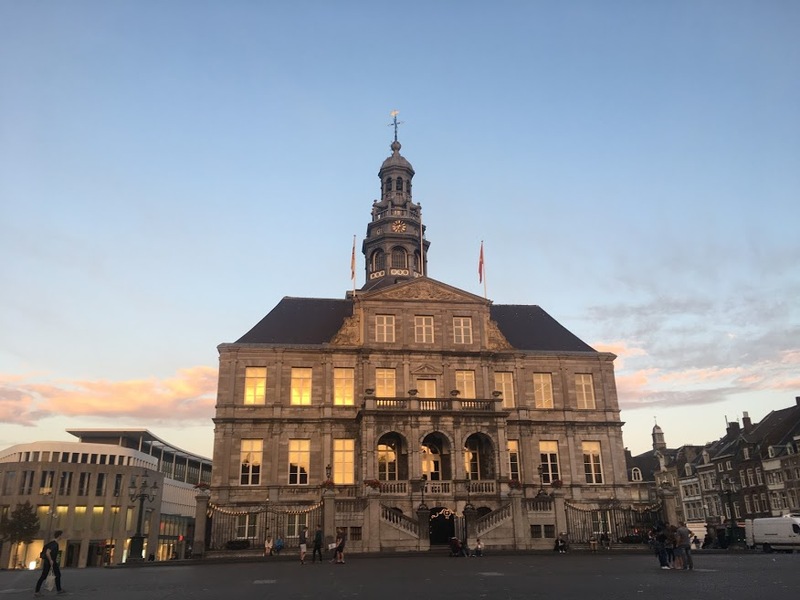 And just a stones throw away from Belgium and Germany, there are plenty of nearby cities to explore that have their own charm but are equally as beautiful as Maastricht. Two weeks ago I had the pleasure of visiting the Balearic Islands in Spain. As soon as I touched down on the island of Mallorca, I knew I had made the right decision to visit. It was 1:30 in the morning and the air smelt as salt and a warm, humid breeze followed me as I made my way to my hostel. Despite being 1 o’clock in the morning, the island was just getting started! Young people packed the streets and restaurant patios were filled with people enjoying tapas and cocktails. Rather than provide a written chronological sequence of my time on the island, I put together a short video filled with the many reasons why I fell in love with the island of Mallorca. From breathtaking landscapes to mouthwatering foods, Mallorca now has a special place in my heart and I highly recommend anyone to visit the exquisite island! 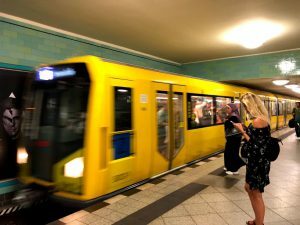 My trip to Berlin took an unexpected turn when I found myself handing over 60 Euro for fare evasion. Hang on a sec, that sounds terrible. By no means am I a criminal. I am however, forgetful, and since I had left my three-day rail pass in my bag that was back at the hotel, I had to pay the consequences. But thanks to my mistake, I’ve come up with a short, yet important list of things to keep in mind when travelling abroad! Before leaving your hotel, always check to see that you have all of your important and necessary items with you. Don’t make the same mistake as me and find yourself handing over money in a situation that could have totally been avoided! When using local transportation, check with station staff to ensure that you’re purchasing a ticket that will get you to where you need to be. Additionally, don’t forget your student ID, for many places offer student discounts! On the contrary, I would advise that items such as your passport and excess cash be left in a safe place, depending on your daily activities. When visiting historical or memorial sites, always be respectful and think/reflect deeply on the symbolism and meaning behind each one. During my trip to Berlin, our group visited many historical sites including Hohenschönhausen Memorial Center (former Stasi Prison), Memorial and Museum of Sachsenhausen former concentration camp and Neue Wache, just to name a few. We were given a guided tour of each site that we visited and I found that one thing in particular was stressed throughout each of the tours – the importance of respect and reflection. It may seem obvious to act respectfully and reflect when visiting historical sites however, and as one tour guide expressed his frustration, some people easily forget. For example, think about when and where it is appropriate to take a ‘selfie’. When taking photos of something historical, remember to understand its significance and the story behind it. Chances are that you will show your friends and family photos of your travels and it is important to be able to share with them the true meaning and symbolism behind each memorial. NEWS FLASH: Your shoes may be comfortable until you have to walk around for 12 hours – dress and pack accordingly!! You’re probably thinking “duh, it’s obvious”, but I can promise you that if you haven’t already worn something you once thought was suitable for a day filled with walking and regretted your decision, you will one day. Travelling to new cities means that you will most likely explore by foot and unless you have the world’s comfiest shoes, I suggest you fill your backpack with Band-Aids and take as many breaks as possibles. On the topic of attire, don’t wear a mid-drift and mini shorts to the German Bundestag (Parliament) or the site of a former concentration camp. R-E-S-P-E-C-T.
You’re travelling to immerse yourself into the culture of the place where you’re visiting, right? What better way than to indulge in the local cuisine. A sure-fire way to get an understanding of an area and its traditions is through its cuisine! No matter where you go, there will be some sort of dish local to the area and chances are, you’ve probably never had it before. Luckily for me, German food is delicious and I happily feasted on Schnitzel and Currywurst. Sometimes however, you may question why such things are being served as food. Nevertheless, always try new things! Afterall, what do you have to lose?! It has been a little over a week since I stepped foot in the land that seems to be doing everything right. There are more bikes than cars. Over 1,000 functioning windmills and all of the country’s electric trains run on 100 percent wind power. 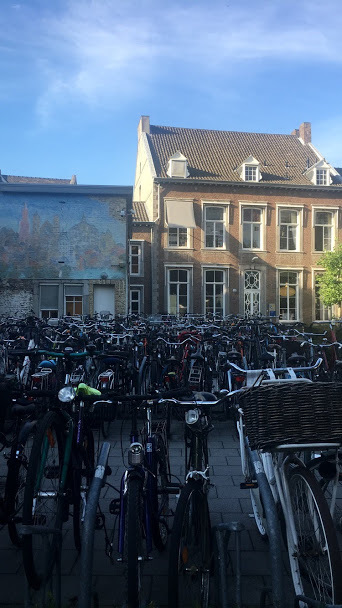 It is safe to say that I have thoroughly enjoyed my first week and I am beyond excited to be spending my final Fall semester in Maastricht, the Netherlands. Over the duration of this semester I will be sharing my experiences with you all and hope to provide you with tips, tricks and recommendations for your own experiences abroad one day. 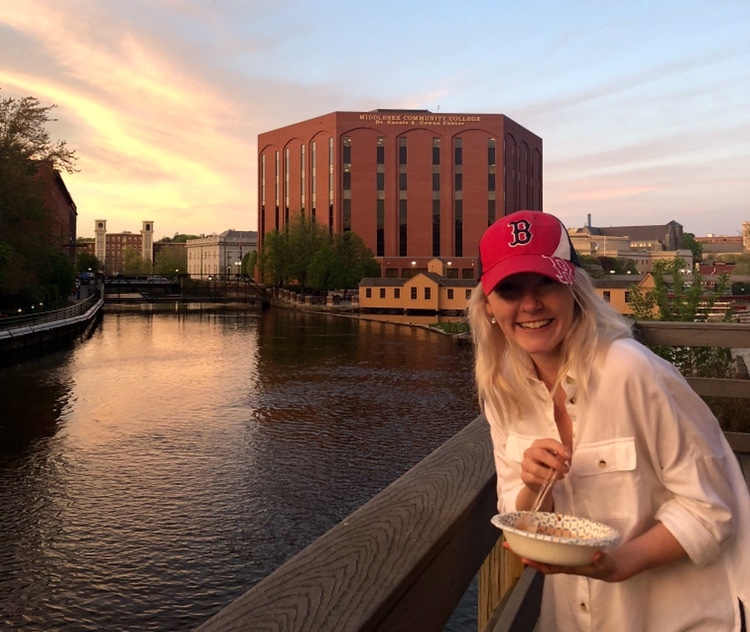 One personal goal of mine is to try as many local foods/treats/delicacies of the places I visit and I will include them in each post of mine (though each post won’t be solely focused around that)! On that note, I spent my first night in Europe in The Hague – home of the U.N.’s International Court of Justice and International Criminal Court. I am fortunate enough to have an uncle that lives in The Hague so I was able to stay with him before driving down to Maastricht. That night we had dinner at an Indonesian restaurant. Since Indonesia was once a treasured Dutch colony, Indonesian dishes are commonly found throughout the country. We shared Rijsttafel, which translates to Rice Table. It is a spread of rice dishes and Indonesian meals. It is said to be a Dutch invention, inspired by the Indonesian multiple-dish meal known as Nasi Padang. 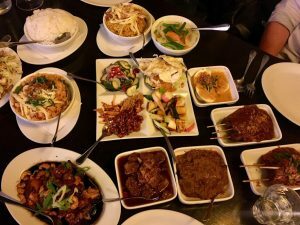 Since it was my first time at an Indonesian restaurant, I am glad that we chose this because it allowed me to try a little bit of everything! After spending the night in The Hague, my aunty and uncle drove me down to Maastricht where I will be studying this semester! 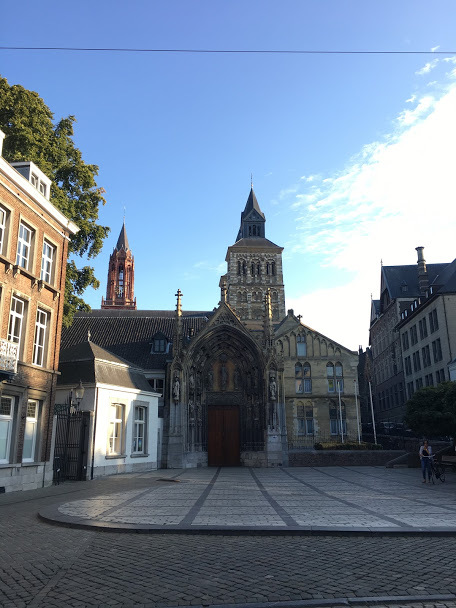 My first few days in Maastricht were filled with some orientation activities and self exploring. First sunset along the Meuse River, Maastricht. I have just gotten back from Berlin and will next post about some things I learnt while visiting the German capital. 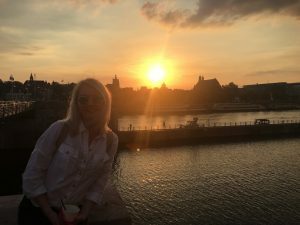 Follow this Fall 2018’s Office of Study Abroad & International Experiences Global Correspondent, Isla Swindles, on her studies in Maastricht, Netherlands! 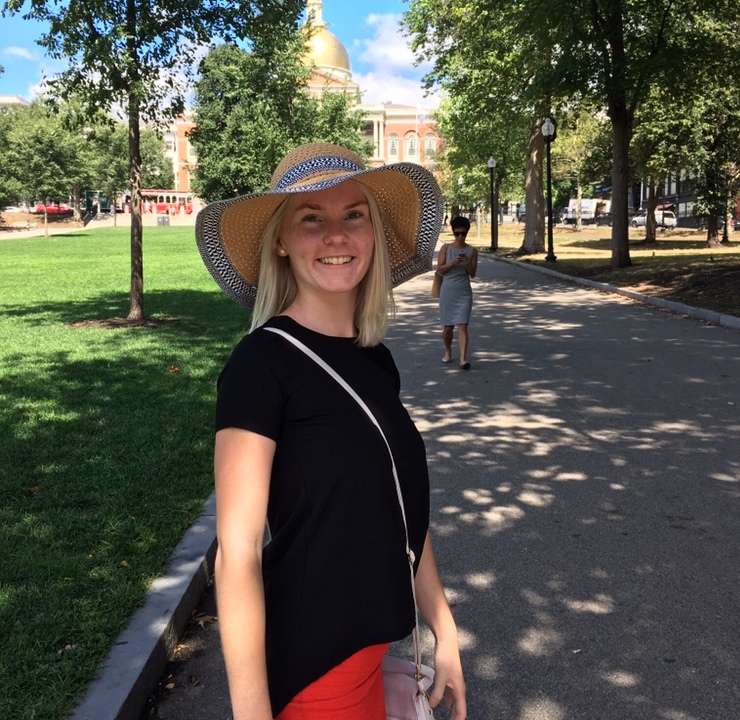 Isla is a UMass Lowell Business Administration major studying this Fall on a UMass Lowell Partner-led in USAC Netherlands: Maastricht University. 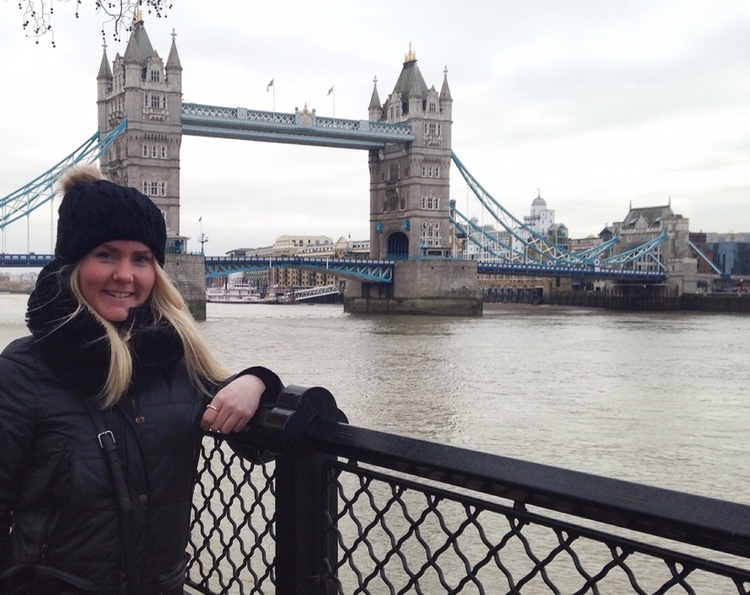 You can also read blogs from other trips across the globe!